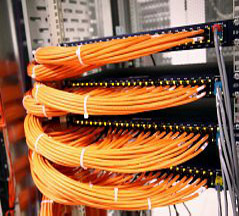 Irvine Network Cabling & Wiring has a team of skilled experts that can fulfill all aspects of network engineering ranging from system design and construction to staff augmentation and voice/data network wiring installation using Cat 5, Cat 5e, Cat6 and fiber optic installation, termination, certification and testing. We will ensure quality control throughout the process and strive to exceed your expectations each step of the way. Cat 5e, Cat 6, Fiber Optic, Wire Management, Patch Panel Termination, Testing, Certification and 25 Year Factory Backed System Warranty. We also offer Irvine fiber optics installation including flexible innderduct, rigid inner duct and corrugated tubing. Cat 3, Cat 5, Cat 6, Telecommunications, Wiring Block Termination, Testing, Voice over IP (VoIP), Hosted Voice Solutions, Commercial Phone System Sales, Installation and Maintenance. 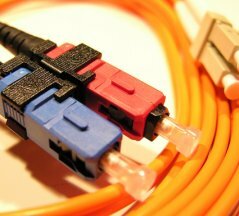 Singlemode & Multimode Fiber Installation, Fiber Optic Backbones, Dmarc Extensions, Network Connections Between Buildings. We are a Irvine network cabling / wiring company that provides voice & data cabling, Irvine fiber optics installation, business phone system sales & installation, VoIP phone systems and other services in Aliso Viejo, Anaheim, Artesia, Atwood, Bell, Bell Gardens, Bellflower, Brea, Buena Park, Capistrano Beach, Carson, Cerritos, Chino, Chino Hills, City of Industry, Compton, Corona, Corona del Mar, Costa Mesa, Cypress, Dana Point, Diamond Bar, Downey, East Irvine, El Toro, Foothill Ranch, Fountain Valley, Fullerton, Garden Grove, Hacienda Heights, Harbor City, Hawaiian Gardens, Huntington Beach, Irvine, La Habra, La Mirada, La Palma, La Puente, Ladera Ranch and surrounding areas. Please contact us for a free site survey and written estimate.